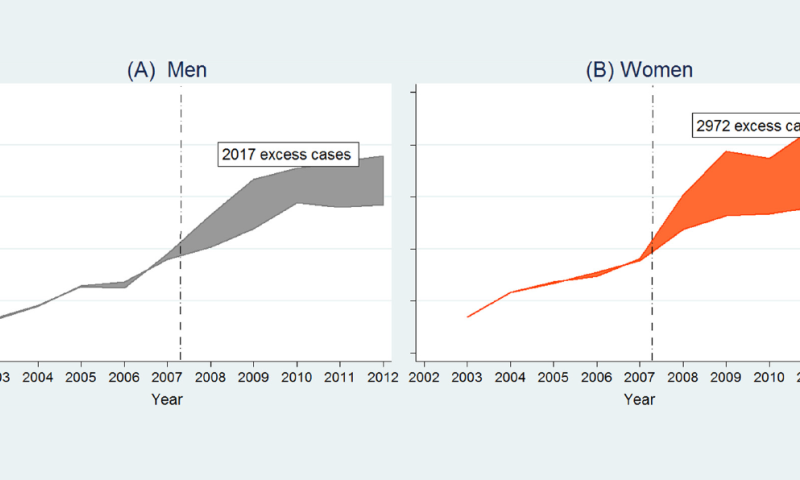 A study carried out in Andalusia, Southern Spain, following the 2007/2008 economic recession detected increasing inequalities in male mortality rates. Men with lower educational levels saw an increase in mortality compared to men with university level education. In addition, 5,000 additional suicide attempts were registered among middle aged men and women between 2008 and 2012. High unemployment and financial strain played a key role in these findings, according to a doctoral dissertation at Umeå University. "Quite surprisingly, we found that people with intermediate educational levels were suffering more mental health problems during the crisis than any other group, and this occurred regardless of whether they were employed or unemployed," says Juan Antonio Córdoba Doña, doctoral student at the Department of Public Health and Clinical Medicine, Epidemiology and Global Health Unit and author of the dissertation. "We also found that social support was strongly associated with better mental health before and during the economic crisis in Andalusia." The findings illustrate the complexity of influences that the economic crisis have had on health inequalities in a region with a very high unemployment rate. According to Juan Antonio Córdoba Doña, the negative effects were further reinforced by austerity policies—tax increases, cuts in budgets and healthcare personnel— imposed on Spain and many European countries in response to the crisis. Despite these impacts on mental health and, to a lesser extent, on physical health, the research did not detect increased inequalities in healthcare utilisation in Andalusia during the first years of the recession. "The universal coverage health system seems to buffer the deleterious effect of the crisis and austerity policies in this context," says Juan Antonio Córdoba Doña. LoL, you media journalists are absolutely hysterical! You always have to write about the recessions instead of the BOOMs! It is always NEGATIVE over positive. Why doesn't anybody realize that the inflationary economical BOOMs, like the one we are in the midst of, are much more physiologically draining than any recession! Would you rather your rent, car insurance, food, drinks, clothes, phones, phone bills, price of living, and almost everything else go UP (during inflation?) Or would you rather these prices go down, during a recession? Have you ever heard that everybody goes nuts with the massive inflation in a bubble? People are going crazy right now, because of the bubbled inflation. And just because I say BuBBLE, it does not mean that it has to pop. Look at Venezuela, they are dealing with hyperinflation, their stock market keeps going up and up and people are having to pay more and more for their everyday items. There is no end in sight and the U.S. and Mexico are next!